Opened in the spring of 1961, the Four Seasons Motor Hotel at 415 Jarvis Street launched the Four Seasons empire of luxury hotels. Builder and budding hotelier Isadore Sharp approached architects Peter Dickinson Associates with the concept of a high-style, premium-service motor hotel in downtown Toronto, and Dickinson responded with a sophisticated yet relaxed urban oasis that became an immediate critical and commercial success. Sharp’s Jarvis Street site was small and in a downscale neighbourhood, so Dickinson turned the Four Seasons inward, focusing the restaurant, bar and most guest rooms upon an interior garden courtyard. Parking and corridors lined the building perimeter, and a fieldstone wall enclosed the entrance drive and buffered traffic. Balconies and screens of black metal and oiled California redwood smartly contrasted the building’s planes of white-painted brick and fieldstone. Guests reached the entrance lobby by crossing a bridge over a shallow reflecting pool with burbling fountains, a symbolic transition sheltered by Dickinson’s trademark flaring canopy. Floor-to-ceiling glass blurred distinctions between inside and outside and provided tantalizing views into the courtyard beyond. Designed by Dickinson and landscape architect Austin Floyd, the courtyard was the glamourous heart of the Four Seasons, drawing the fashionable to see and be seen in warm weather. The swimming pool and dining terrace were the principal elements, intimately enclosed by low fieldstone walls, lush planting beds and thick lawns with flagstone pathways. Water soothingly splashed from spouts at the head of the swimming pool, and cocktails were served by waiters in white mess jackets. Completing the Miami Beach resort atmosphere were colourful sun umbrellas and Court Noxon’s poolside chairs and lounges. 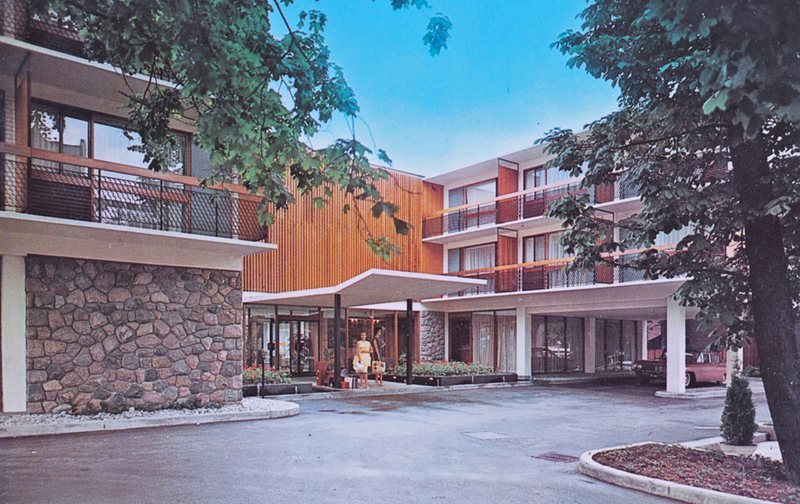 The success of the Four Seasons prompted Sharp to begin planning a second resort motor hotel, this time on a prominent hilltop property at Leslie Street and Eglinton Avenue in North Toronto. Peter Dickinson sketched for Sharp a dynamic star-shaped building, and the resulting Inn on the Park opened in 1963. Webb Zerafa Menkes (later WZMH Architects), the successor firm to Peter Dickinson Associates, went on to design numerous Four Seasons hotels around the world. The original Four Seasons was leased to another hotel chain in the mid-1970s and demolished some 15 years later, but it remains a landmark in the evolution of the luxury hotel experience. For more about the Four Seasons, the Inn on the Park and other Peter Dickinson buildings, see the recent monograph Peter Dickinson, available through Dominion Modern. Great post Robert. I’m thinking the curators for the VAG’s upcoming show, Grand Hotel, would be interested in this. Hi – thanks for the compliments and the link to Grand Hotel – sounds like a wonderful show. If I’m back in Vancouver I’ll be sure to see it. THANK YOU so much for printing these photos and story. 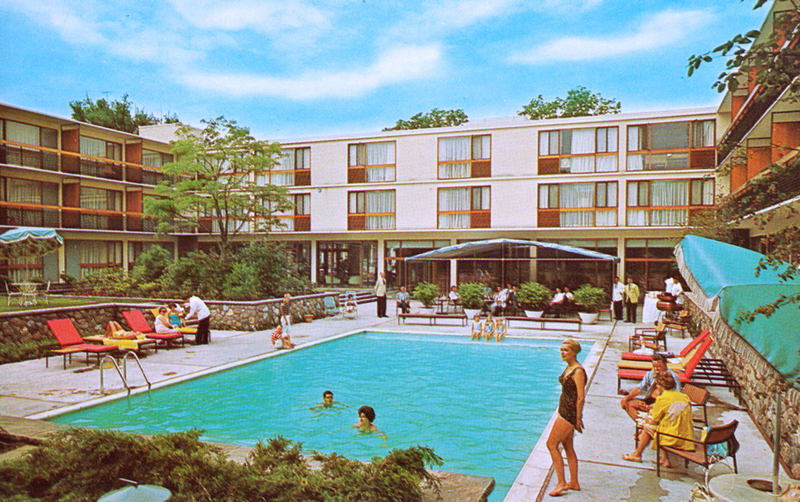 Looking at the pool photo I was jolted back 40 years into my childhood when my dad – as a treat – would rent us a room just for the day (we lived in the Toronto burbs) at this hotel. My sister and I could invite a girlfriend each and we’d swim and sun all day feeling very sophisticated indeed. My mother would order tea at around 4 pm and then we’d go back home. They tore the place down a few decades later which greatly saddened me. Another landmark destroyed. Just like they did to the marvellous Inn on the Park hotel on Leslie. Thanks for your story – wish my parents had done something similar! I stayed at this hotel while visiting Toronto with my family during the summer of 1985. It was called the Hampton Court Hotel then. I remember the swimming pool very well. I stayed there again in July of 1987 when visiting the Ryerson campus prior to beginning classes there in September. Fans of the old 1980’s TV show “NIght Heat” might also recognize this hotel in one of the episodes as the “Lions Court Motel”. Now, like most landmarks in Toronto, it’s been long bulldozed. Thanks for the memories! Stayed there for a few weeks, in 1974, at CBC’s expense, when I came here from Vancouver to perform the Toronto scenes of a God-awful TV series, “The House of Pride”. It was across the street from their old studios. Odd place. Snotty night desk staff, and overpriced, mediocre food. The estimable Elwood Glover did his “Luncheon Date”, or some such world-famous-in-Canada tedium, daily from the lower level (I think). Saw resident genius/wacko, Glenn Gould standing outside in winter clothing. It was late May, 87 Fahrenheit. I worked the desk back then. The desk staff were snotty? Re-read your post! The Inn on the Park was a grim, tasteless, pretentious architectural atrocity, in an ineffably dismal suburb. Why the fuss about its merciful fate? A grim, tasteless, pretentious architectural atrocity????? I adored that place!!! It was so avant-garde and sophisticated for its time! The Inn On The Park was across from a huge beautiful park and green space and around the corner from some of the most gorgeous homes/neighborhoods in Toronto (The Bridlepath). As for design, it was considered a very cool modern building for the times. You just sound like a Toronto hater. I see Mr. Stein’s comments were posted at 4:40 am. Could be he was suffering from “blurred vision” at the time. I was one of the ‘snotty” night staff. Maybe I refused to cash his personal cheque. I worked the reception desk at the this lovely hotel. It was a hang-out for Lloyd Robertson (between broadcasts) Bruno Gerussi (before he became famous) and was home to Glen Gould. (I saw only Mr. Gould’s eyes. He kept his face covered when he came to the desk to pay his rent.) The Elwood Glover show was broadcast from the lobby in those days. (Guests included Werner Klemperer (Col. Klink Hogan’s Heroes) During my time the hotel hosted a cocktail party for Glen Campbell; Fond memories.